Your team members are constantly sending you Slack messages asking you to remind them of deadlines. Your client won’t stop emailing you, asking who’s responsible for what part of the project, and when. And your subcontractor is texting you incessantly about her start date. Stop the communication madness and make a Gantt chart. 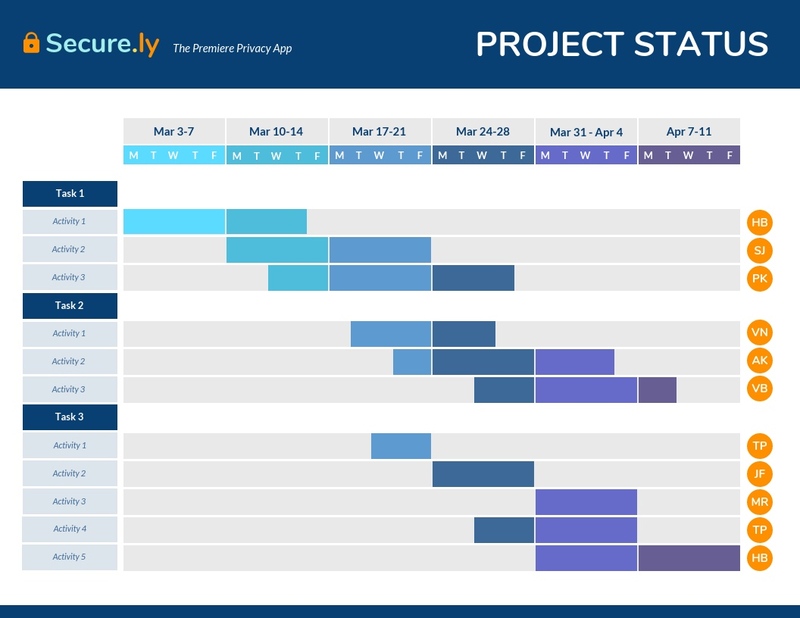 A Gantt chart lets you communicate your project timeline visually in an easy-to-understand way. Everyone’s in the loop, so you can get work done faster and easier. Keep reading for Gantt chart examples, plus tips on how to create Gantt charts that are professional, attractive and simple to understand. 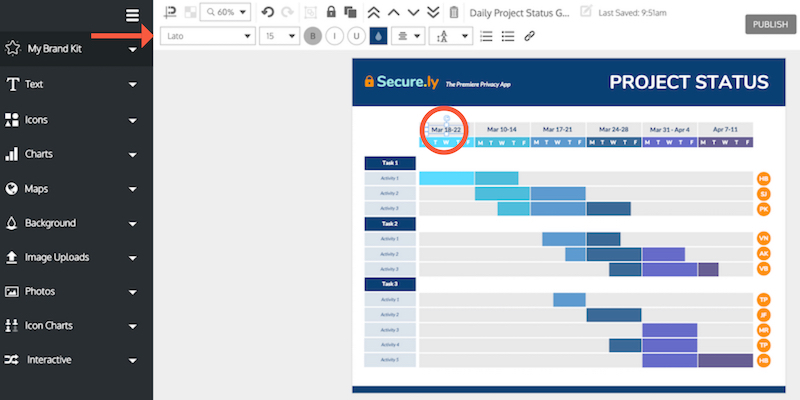 Get Gantt chart templates you can customize and use right now, too. Why Is a Gantt Chart Important? What Are the Parts of a Gantt Chart? A Gantt chart is a timeline of a project. 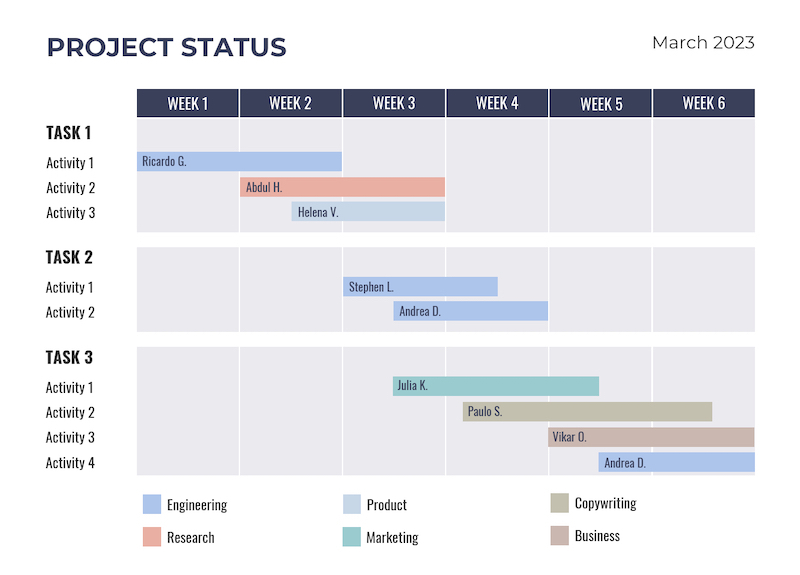 The top of the chart shows the time frame and the left side of the chart lists the project activities. Each activity listed on the left hand side of a Gantt chart has a colored bar next to it. The position and length of that bar depends on the activity’s timeline and duration: when it starts and when it ends. For example, in the daily project status Gantt chart above, Activity 1 (Task 1) will take place from March 3 to 7 and then March 10 to 13. The due date is Thursday of that week. Each week is color coded. 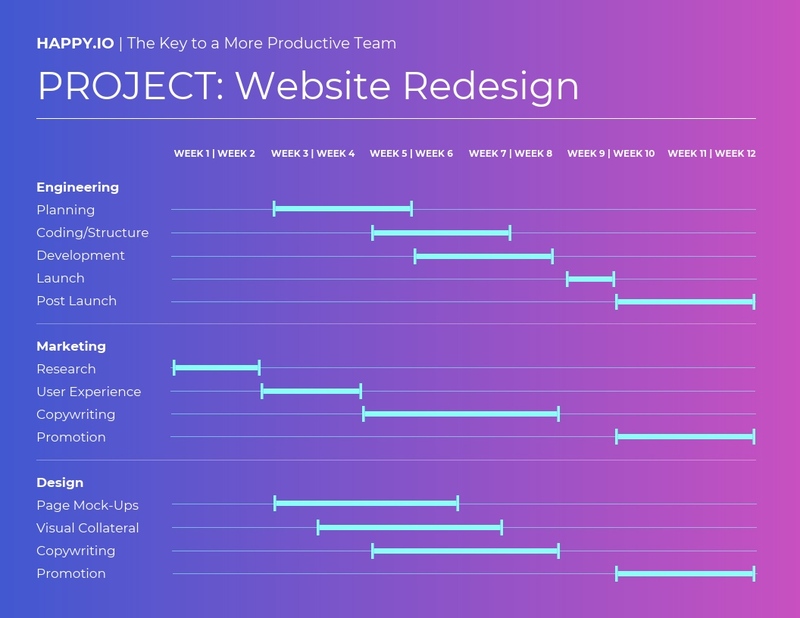 Like the previous example, this retro daily project Gantt chart example breaks down project activities day by day. It also breaks down who’s responsible for what project activity. For example, Task 1/Activity 1 is color coded red. Sonya J. is responsible for it from September 3 to 14 (two weeks). Amir K. is responsible for it from September 17 to 21 (one week). Julia F. is in charge of Task 1/Activity 1 from September 17 to October 2. Her red bar shows that the due date is Wednesday. The magic of a Gantt chart is that it lets you set the order in which tasks should be completed. And since Gantt charts are in an easy-to-understand timeline format, the task order is crystal clear. Your team and/or clients won’t need to ask you again and again when Mark is supposed to be working on link building. Phew. This template would work especially well for consultants, as the client can get a visual representation of the team working on their project. Putting faces to the names creates confidence in the client and helps build your reputation. 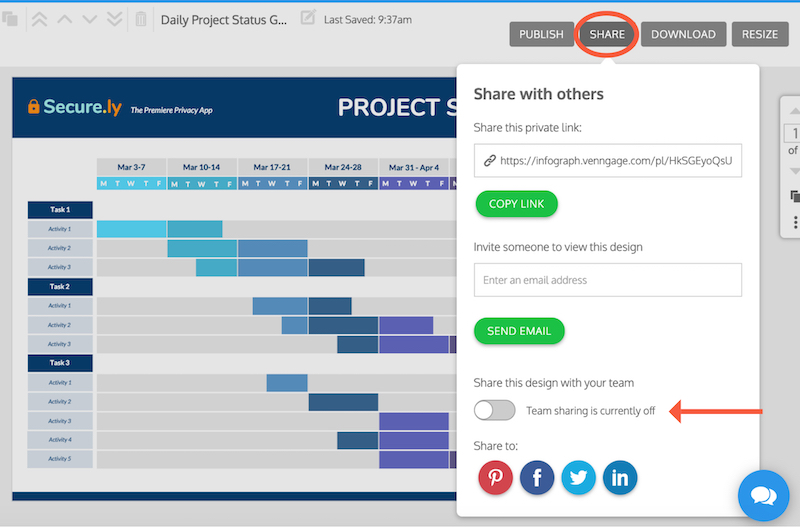 Pro Tip: Use Venngage’s collaboration features to add team members (like your client) to your account and share your Gantt chart seamlessly. Get feedback and approvals faster within one channel, without having to juggle Slack messages, emails or G Suite comments. This corporate weekly project Gantt chart example is more traditional than the previous example. The focus is on the activities and their types, not the individual people. The types of activities, such as engineering or marketing, are color coded. For example, Task 3/Activity 1 is a marketing activity that will take place from the middle of week 3 to the middle of week 5. Julia K. is responsible for this activity. 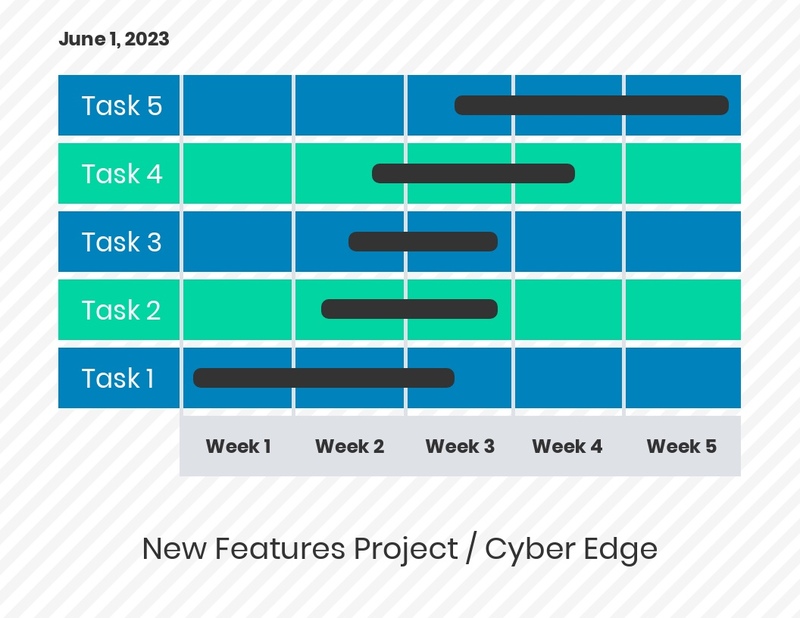 This futuristic-looking Gantt chart example is perfect for teams who operate on the sprint system. The template is divided into two week sprints, but you can change this to a one week sprint (or longer) as needed. The left hand side is divided by team and further divided by activity. For example, the engineering team will do planning from the beginning of week 3 to the end of week 5. Pro Tip: When you’ve finished editing your Gantt chart in Venngage, click “Share” in the top right corner of the editor to email or get a link to your design. Or click “Download” to download a PDF or PNG file to your hard drive (Premium and Business plans only). 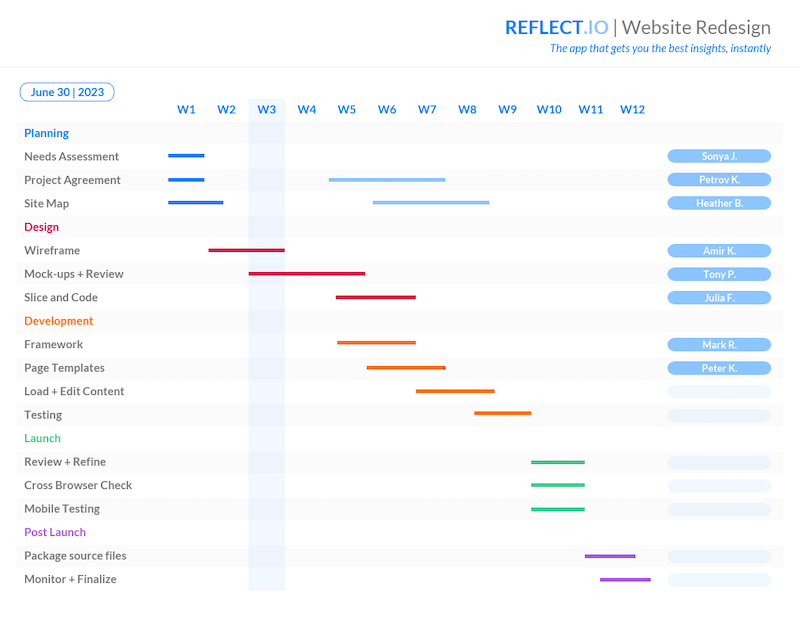 Add your Gantt chart to your weekly team meeting presentation. Consultants can add them to their proposals or project plan. Construction projects can suffer from “too many cooks in the kitchen” syndrome, making it really hard to meet deadlines. 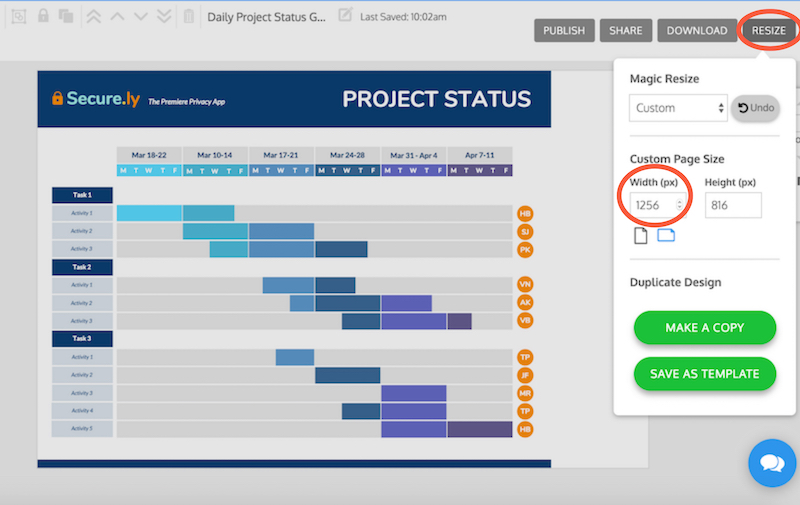 Gantt charts are a great way to keep construction projects on schedule and make sure clients, crew members and subcontractors are in the loop. 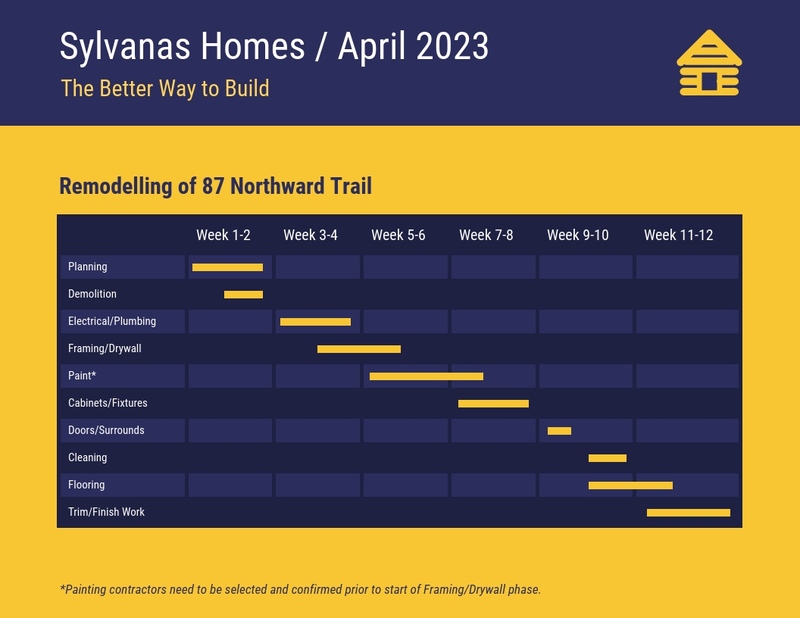 This dark home construction project Gantt chart example will make sure everyone’s on the same page. The chart’s simple format makes it easy to see what activity is due when. You can edit the Gantt chart as the project progresses. For example, if an activity is taking longer than it should, extend the bar’s length and make that section red. That way, everyone is instantly aware of overtime and potential project delays. 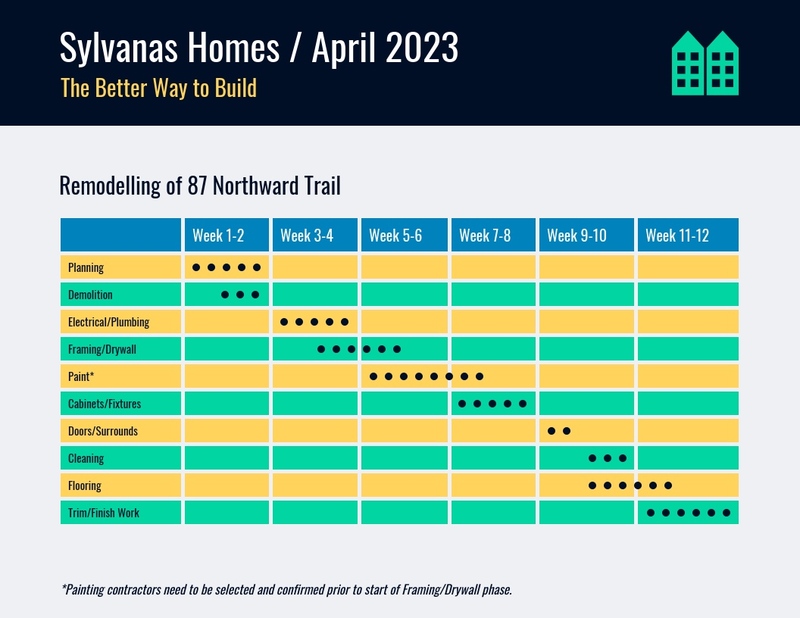 This light home construction project Gantt chart example is almost the same format as the previous one, but the dots represent two day intervals. For example, demolition will run from Friday of week 1 to Friday of week 2 (six days). Pro Tip: Venngage’s My Brand Kit tool lets you apply your brand colors to your Gantt chart template with one click. My Brand Kit also lets you include your logo and apply brand fonts. For example, in the above template, using My Brand Kit would change the blue, yellow and green background color scheme to your brand’s color scheme. You can then click “shuffle” to cycle through the color combination options. New product in the works? 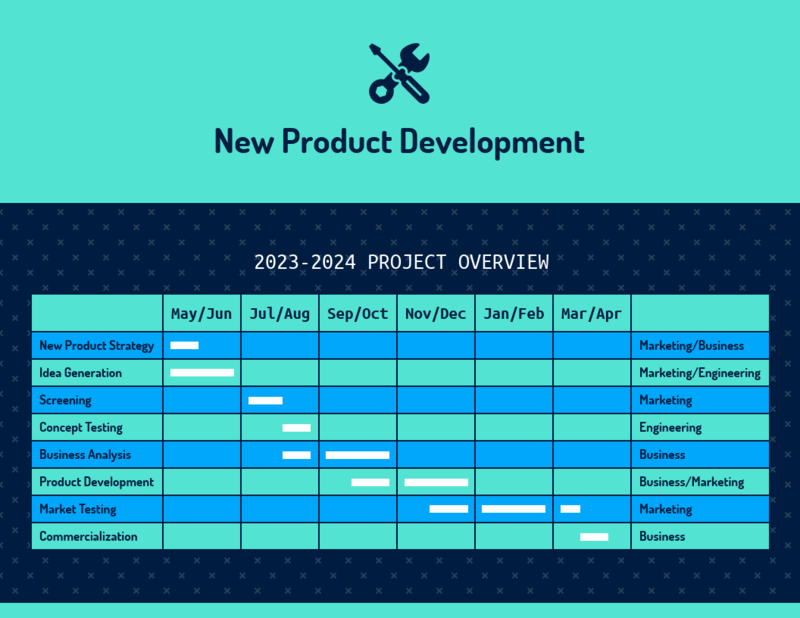 Use this dark new product project Gantt chart example. The far left hand column maps out the activities, while the far right column lists what department is responsible for each activity. Product development typically involves multiple departments or teams of people. There may be no one project leader, either–only multiple managers, on multiple teams. A Gantt chart is the perfect way to manage tasks between multiple teams as all the information is in one place, in a crystal-clear format. It eliminates confusion about dependencies i.e. who needs to finish what before another team can begin their task. 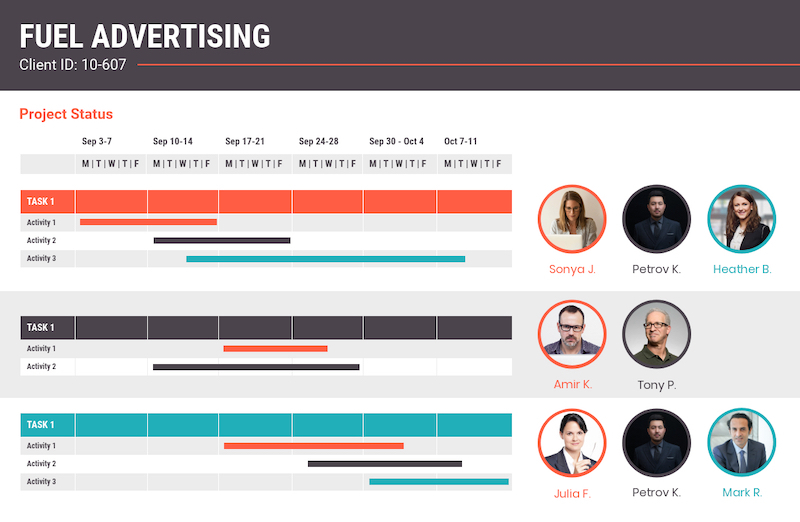 Pro Tip: You can also include the chart in your business report or presentation. Download your finished Gantt chart as a PNG file (Premium and Business plans only). 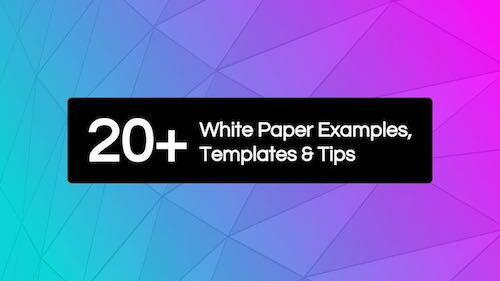 Choose a presentation template from our library. Once you’re in the editor, click the “Image Upload” tab to upload the Gantt chart and add it to your slides. A business plan tends to contain a lot of information and can quickly become overwhelming to potential investors. 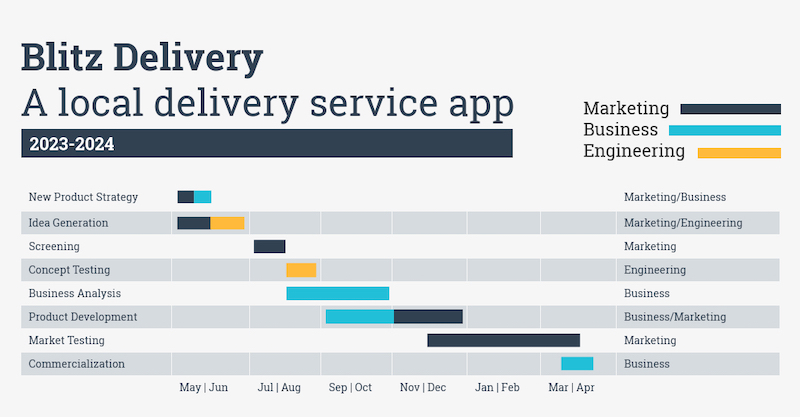 Visualizing schedules, research or data will help break up all the text and quickly communicate key deliverables. Investors need to see that you have a concrete plan in place that will let you achieve your revenue goals. 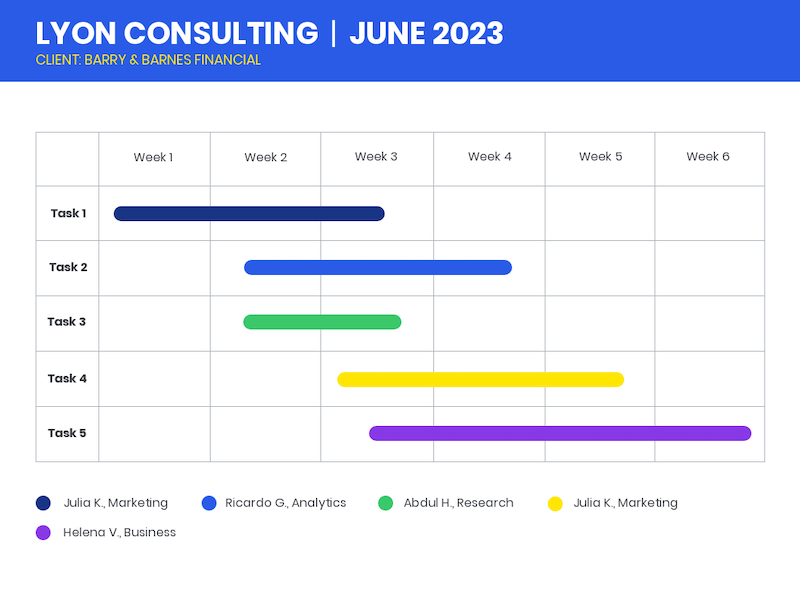 One strategy is to use a Gantt chart to visualize your business plan’s growth strategy or marketing plan. Use the Gantt chart example above to plot your business strategy and major milestones. Edit the time frame on the bottom to plot out stages by quarter–over several years, if you like. You can also include this Gantt chart in your project plan. Your client’s hired you to help them achieve their goals. But, let’s say they’re a new client and they need a little more reassurance that you, the consultant, is on top of things. Show your client that you have a workable roadmap to success with a Gantt chart. Edit the above Gantt chart example and divide tasks–between your team, any subcontractors and your client’s team. Refer back to the chart during your weekly calls with the client to make sure you’re both on the same page. 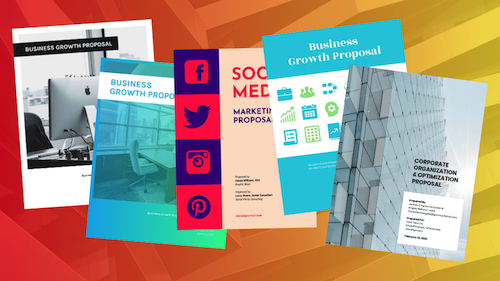 If you’re overwhelmed by admin work, check out our proposal templates and consulting report templates and get important documents out the door a lot faster. They’ll also look plenty better than those Word documents you usually churn out! Pro Tip: Love your Gantt chart’s layout and want to use it again for other consulting projects? Save it as a template in Venngage. That way, you can reuse it whenever you need to make a Gantt chart for another client. Gantt charts are important because they make scheduling, planning and executing on projects easier. Projects often involve multiple stakeholders, activities and deadlines. Gantt charts visualize all these factors so that project managers and their teams can quickly understand who needs to do what and when. This will help make sure each deliverable is completed on time. Which in turn will prevent a snowball effect of missed deadlines, causing the project price to go up and the completion date to be pushed back. Gantt charts aren’t industry specific, either. They’re a critical tool for anyone managing a long-term project that has lots of tasks and a complex schedule and that requires collaboration. Telecommuting has risen 140 percent since 2005, according to Global Workplace Analytics. As this number continues to skyrocket, a Gantt chart becomes even more critical for team management and to effectively plan and track work as a team. When you first look at a Gantt chart, it might seem overwhelming. What do the bars or lines mean? How do they relate to the x and y axes? But, on second glance you’ll see that the beauty of a Gantt chart is actually in its simplicity. Of course, more complex projects require more complex Gantt charts. The Gantt chart example below takes things a step further by dividing activities into smaller tasks. For example, “Planning” is divided into: needs assessment, project agreement and site map. This Gantt chart also lists (on the right) who’s responsible for each task. Choices, choices. 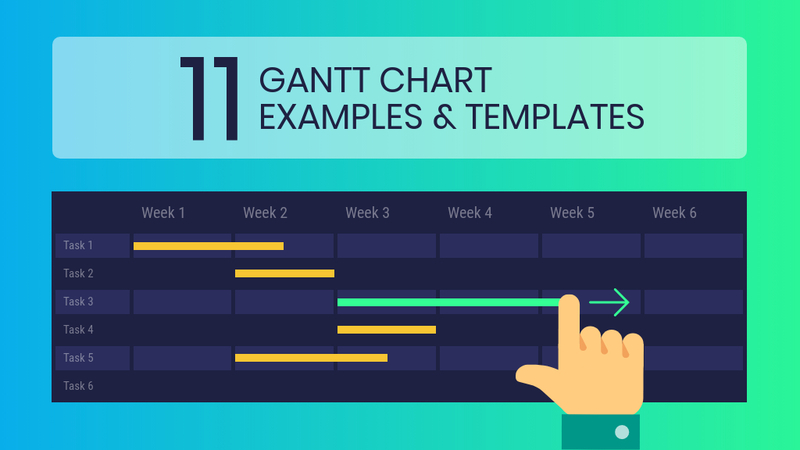 Open our Gantt chart template gallery. Start by laying out the timeline of your from left to right, creating divisions by day, week, month, or quarter. In this Gantt chart template, click the text box you want to edit and start typing. Or delete the days of the week and add months or quarters, instead. Made a mistake? You can click “undo” in the top toolbar at any time. To add a new column to the right, click “Resize” and increase the width of the custom page size. Try adding 200 more pixels and readjust as needed. Then, drag and select all the orange icons to move them to the right at the same time. Drag to select the entire the dates section and click “copy” and move into place. Edit the dates. Now, drag to extend the beige bars. Use the “snap to guide” feature to help you align everything perfectly. Click the tasks and activities to edit the text. Use the top navigation bar to change the font style, size, color etc. Adjust each bar so it begins at the task’s start date and extend it to end to the expected task deadline. Click each bar to move it or drag. The snap-to-guide feature will help you align the bar with the specific day of the week above. Copy other bars with the right color and move them into place to extend the timeline of a task. You can also click the orange circles to assign each task to a different person–in the above Gantt chart template they’re indicated by initials. 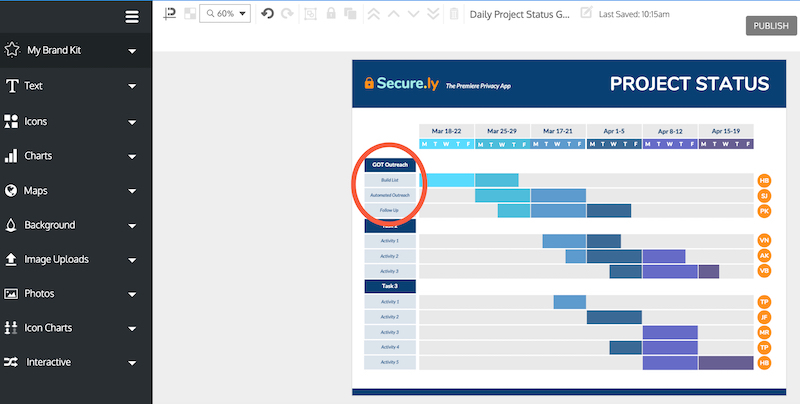 Brand your Gantt chart with one click by opening the My Brand Kit tab. Drag your logo into place. Then, click a “My Brand Colors” palette to apply these colors to the entire template. Click “Shuffle” to scroll through different color combinations. Very cool. Want a different type of design? Discover even more Gantt chart templates. Pro Tip: Struggling to customize your Gantt chart just the way you want it? Venngage offers priority support via email, chat and phone and 1-on-1 consultations to Business plan members. Ask our designers for tips on how to present your idea visually–whether in a Gantt chart or a presentation, report, white paper etc. What’s your number one struggle with managing projects right now? Let us know in the comments below!